A high-flying adventure from the magic of Steven Spielberg, Hook stars Robin Williams as a grown-up Peter Pan and Dustin Hoffman as the infamous Captain Hook. 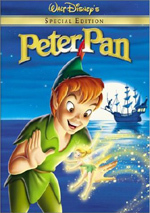 Joining the fun is Julia Roberts as Tinkerbell, Bob Hoskins as the pirate Smee, and Maggie Smith as Granny Wendy Darling, who must convince the middle-aged lawyer Peter Banning that he was once the legendary Peter Pan. 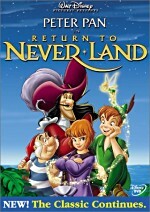 And so the adventure begins anew, with Peter off to Neverland to save his two children from Captain Hook. Along the way, he rediscovers the power of imagination, friendship, and magic. Opening Weekend $13.522 million on 2197 screens. It always seemed somewhat strange to me that Hook is considered one of Steven Spielberg's "B-list" titles. That meant it was lumped in with lesser lights such as Amistad, Always, and Empire of the Sun. This made little sense to me because Hook actually did quite well at the box office; it made $120 million, which may not approach the mega-bucks of E.T. or Jurassic Park but seems substantial enough to warrant a greater profile for the film. Because of this incomparable track record, Hook was supposed to be the big film of the Christmas 1991 season, but it couldn't even take the crown for just the winter. Disney's Beauty and the Beast raked in more than $171 million and left Hook in the dust. 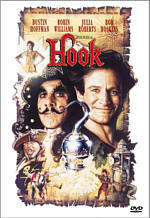 Ultimately, Hook only could rise to finish in fifth place for 1991, after Beast, Robin Hood: Prince of Thieves, Terminator 2 and The Silence of the Lambs. That was a pretty dismal fate for a film with such a strong pedigree. Even if Hook had done much better at the box office, though, I still think it'd be regarded as a lesser film simply because it is a lesser film; this is the sight of Spielberg running on autopilot. While it's not his worst movie, Hook has to stand as one of Spielberg's most disappointing. He had long told of his desire to make a version of Peter Pan, and now he had his shot, with a $70 million budget and an all-star cast that included Robin Williams as Pan, Dustin Hoffman as Hook, and Julia Roberts as Tinkerbell. All of which proves the old saw about the whole being much less than the sum of its parts. The detail that went into the sets and the entire production design is dazzling; clearly the crew went all-out to create a number of lavish and compelling settings. Overall, the acting really is quite good. Roberts seems fairly flat as Tinkerbell, but Williams does a terrific job as Peter. He takes a surprisingly complex role - since he has to play Peter as older and serious as well as "classic Pan" - and makes all aspects of it realistic and believable. Williams is even able to come across as awkward in a public speaking situation and can deliver jokes in a flat manner, something I would have felt was impossible for him. Hoffman is pretty good as Hook but he can't quite compete with more deliciously flamboyant performances like Jack Nicholson's turn as the Joker in Batman. Still, Hoffman gets the job done and makes for a fairly interesting Hook. Bob Hoskins does some nice work as Hook's long-suffering sidekick Smee as well. The film's climax is really pretty well done. Those kinds of bits are Spielberg's trademark, and he doesn't disappoint as he delivers a finale that gives the affair a rousing conclusion. The ending is a bit over the top, but that's to be expected and actually welcomed in this kind of film. As these past few paragraphs demonstrate, Hook has some positives. Unfortunately, negatives such as the film’s length heavily outweigh these. At more than two hours and 20 minutes, Hook is much too long and it moves at a snail's pace for the most part. Spielberg seems far too concerned with establishing the back-story, an issue that appears almost meaningless. The audience is already familiar with most of the characters, and the plot's main twist - that Pan has grown up and become a serious adult - doesn't take an hour to explain. If I was so bored by what was happening during much of the movie's first half, I can't imagine how bad it must be for younger kids. The kiddie problem here comes from the Benetton ad castoffs picked to play the Lost Boys. From the biggest to the smallest, they all share one characteristic: they're really annoying and they consistently bring down the film. These kids scream "Hollywood cute" so loudly that the sound drowns out any positives; all I could think when they were onscreen was how much I hoped they'd leave. Since the Lost Boys are a major component of the Neverland scenes, that's not a good thing. Their segments showed the film's flaws in other ways as well; at those times it was much easier to distinguish how much of Hook favored spectacle over heart. It's pretty clear that by this point in his career, Spielberg was not the same filmmaker he was a decade or more earlier. He entered his "serious" stage and simply didn't seem very interested in fun movies. Hook was supposed to mark a return to that territory but all it demonstrated was how far out of touch he had become. He'd regain his talent for the spectacular with Jurassic Park, of course - its detractors have to recognize what an exciting piece of work it remains, and even its much maligned 1997 sequel (The Lost World) offers some terrific action pieces - but Hook clearly marked the demise of Spielberg's ability to create something along the lines of an ET. And that's too bad, for as good as his straight action films are, Spielberg really excelled at the magical fantasies like ET and . He hasn't attempted another film of that sort since Hook and I honestly don't think he will; right now Spielberg appears able to invest himself in either exciting action flicks that lack depth or more serious historical pieces and that's it. The Spielberg who made so many of us cry over a wrinkly puppet in 1982 is dead, and Hook acts as the funeral. Okay, that last statement may be overly dramatic, especially because Hook isn't without its charms, especially if you can wade through the cutesy Lost Boys and the film's excess of exposition. Still, it remains a tremendous disappointment. I wanted to like Hook when I saw it theatrically in 1991, and I wanted to like Hook when I watched the DVD. Unfortunately, there's too little of consequence happening here. The movie has its moments but too few to make Hook anything more than an intermittently fun film. 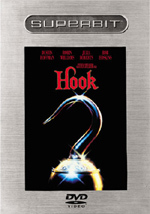 Hook appears in an aspect ratio of approximately 2.35:1 on this single-sided, double-layered DVD; the image has been enhanced for 16X9 televisions. Hook felt like an odd candidate for the Superbit treatment. After all, the original disc essentially got the Superbit treatment. The dual-layered disc only included a small sampling of extras that filled little space. As such, the movie itself already received optimal bit usage. Because of that, I didn’t expect any improvements in this Superbit edition, and I didn’t find them. The two DVDs seemed virtually identical visually. The old one looked great and the Superbit release presented similarly outstanding picture quality. Sharpness seemed immaculate. The movie consistently came across as tight and well defined. A few effects shots – like one that combined Hook and Tinkerbell – looked a little degraded due to the techniques involved, but those were inevitable, and they offered the movie’s only examples of minor softness. I saw no instances of jagged edges or moiré effects, and the film also seemed to lack edge enhancement. As was the case with the original DVD, print flaws played no real role in the proceedings. Some stock footage of an airplane showed a few specks, but otherwise this was a clean image. Colors looked very vibrant and lush and displayed full saturation. This aspect of the picture worked especially well during the Lost Boys scenes, since they provided many situations with a variety of hues, but all parts of the film showed accurate and clean colors. Black levels generally seemed very good, and shadow detail usually appeared clear and appropriately deep; at times the image could seem overly dark, but most of these instances appeared to result from the original film, especially since the majority occurred in the low-lit situations at the start of the movie. The film used diffuse lighting there that came across well. Hook remained a very attractive image. The Superbit version of Hook added a DTS 5.1 soundtrack to the original disc’s Dolby Digital 5.1 mix. As with the image, fans shouldn’t expect any improvements from the old disc. When I compared the DTS and Dolby tracks, I thought they sounded identical. I discerned no differences between the pair. Imaging was generally full and broad, though I must admit I was surprised at how underused the rears were. For the most part, the surrounds provided John Williams' score with only occasional effects on display. That's not a perfect rule, of course, and some scenes presented very good material from the rears, but these examples didn't happen very often. Nonetheless, the overall soundstage seemed appropriately wide and engrossing. Stereo usage of the front speakers spread the image out nicely, and the occasional rear effects added to the impression. Split surround usage was pretty subtle but it's definitely there; I most noticeably detected stereo music from the score as well as some minor split effects. While I liked the soundstage, I was more impressed by the quality of the audio. Across the board, Hook sounded top-notch. Dialogue remained clear, natural and intelligible, and effects seemed realistic and clean. Music sounded particularly good. Williams' score came across with great clarity and dynamic range. It really pumped out some fine bass as well and sounded broad and rich. Hook wasn’t quite involving enough to reach “A” territory, but this high-quality audio earned a solid “B+”. One oddity about this version of Hook related to its other soundtrack. Whereas virtually all other Superbit titles only featured original language mixes, this one tossed in a French 2.0 track. That didn’t fill too much disc space, but given the Superbit mission to waste as few bits as possible on non-essentials, it seemed like a strange addition. Although something like Starship Troopers lost lots of extras when it got the Superbit treatment, this factor didn’t mar the release of Hook. While the Superbit disc includes no supplements, the original only presents some crummy “Talent Files” and a couple of trailers. They’re not really missed here, though it would have been nice to get the decent production notes from the old set’s booklet. Why Superbit releases don’t include those sorts of texts makes no sense to me; last time I looked, paper inserts don’t tax disc bit rates. Hook remains a film that I really wish I could love but I can only moderately like at best. It simply possesses too many flaws to become something that even remotely compares to Spielberg’s finest work. The DVD presents very strong picture and sound but totally omits any extras. Should fans who already own the prior DVD of Hook “upgrade” to the Superbit edition? I don’t think so. The pair looked and sounded awfully similar to me, so unless you’re just dying to get that DTS track, stick with the old one. The same sentiments go for anyone who doesn’t already own Hook - I can’t think of any strong reasons to take the Superbit version over the standard one. The latter’s a little cheaper and appears to present virtually identical quality.